Summerland Sanitary District is an independent special district which provides wastewater collection, treatment and disposal services to the residents within the Summerland District boundaries. We provide a community service committed to protect public health and safety; we are committed to preserving the natural environment through responsible collection, treatment and disposal of wastewater in the most cost-effective way possible. 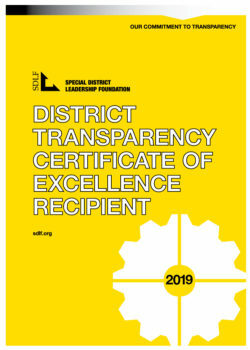 The Summerland Sanitary District received the District Transparency Certificate of Excellence in April 2019 by the Special District Leadership Foundation (SDLF) in recognition of its outstanding efforts to promote transparency and good governance.